One of the major party candidates in the New York race for governor has issued a “civility challenge”, asking his opponents to refrain from all negative ads and attacks from now until Election Day. Republican candidate for governor, Marc Molinaro, says the toxic level of “vitriol” and the events of recent days including - pipe bomb devices sent to leading Democrats who are critics of President Trump, and the shooting at the Pittsburgh Synagogue that took 11 lives- have led him to make changes to his campaign. He says he will halt all negative advertising or attacks on his opponents between now and Election Day. 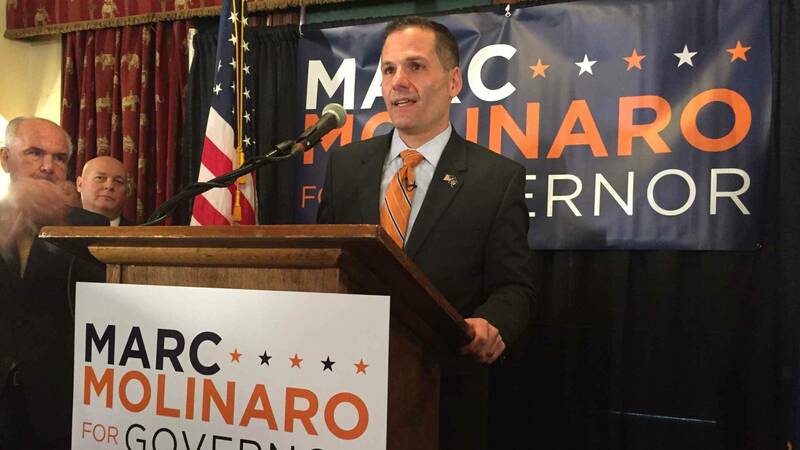 Molinaro is calling on the Democratic candidate in the race, incumbent Governor Andrew Cuomo, to do the same. Molinaro says he will instead focus on a message of “hope and aspiration”. And he says he’s taken down an ad accusing Cuomo of corruption. Cuomo also called for an end to angry rhetoric during multiple appearances on cable news channels after the pipe bombs were discovered in the mail for former Presidents Clinton and Obama, and others. On Monday, the governor reacted to the Pittsburgh Synagogue shooting. “And anyone who seeks to divide, anyone who seeks to separate, anyone who tries to segregate, who is worthy and who is unworthy, that is not an American as we have defined it in this nation,” Cuomo said. But Molinaro says Cuomo has not applied the same principles to his own campaign and is continuing to buy time on television stations and on social media to promote negative ads attacking Molinaro. Cuomo, in a heated debate with Molinaro on October 23rd, tried to tie Molinaro to President Trump, and Trump’s negative rhetoric. Molinaro, who has distanced himself from Trump in his campaign, says those accusations just continue the negative cycle. The Republican candidate for governor did not directly criticize the head of his party, but he did condemn some of Trump’s specific acts in recent days. Independent candidate for governor and former Syracuse Mayor Stephanie Miner says she’s been practicing civility all along. She says that’s the point of her campaign, which is backed by a new political coalition that includes Democrats and Republicans. In a statement, Miner said “We’ve been talking about how hyper-partisanship is failing our state. New Yorkers expect and deserve real solutions fostered by civil dialogue, not snarky sound bites - at all times, not just 8 days before an election”. In the final days of the campaign, Molinaro has far less money to spend on ads, negative or positive than does Cuomo. According to filings with the State Board of Elections, Cuomo has $6,753,406.48 in his campaign account while Molinaro has $311,963.73 left. The Cuomo campaign responded several hours after Molinaro issued his challenge, saying they are “glad” Molinaro is finally joining the governor’s calls for civility. Spokeswoman Dani Lever turned the focus back to Trump, saying if Molinaro wants to ask someone to be civil, he should start with the President. Molinaro says even if Cuomo doesn’t agree to the civility challenge, he’s going to do it anyway. He says Cuomo is his “opponent”, not his “enemy”.